Apple Cinnamon Granola. For me, cold cereal just doesn’t cut it. Who has ever had a bowl of cereal that kept them full until lunchtime? Um, no one! I am usually starving an hour later! That is why I love homemade granola. Homemade granola keeps me full until lunchtime. Apple and cinnamon go so perfectly well together too. This apple cinnamon homemade granola is one of my favorite recipes. Homemade Apple Cinnamon Granola is great as a snack, over yogurt or as a cereal. 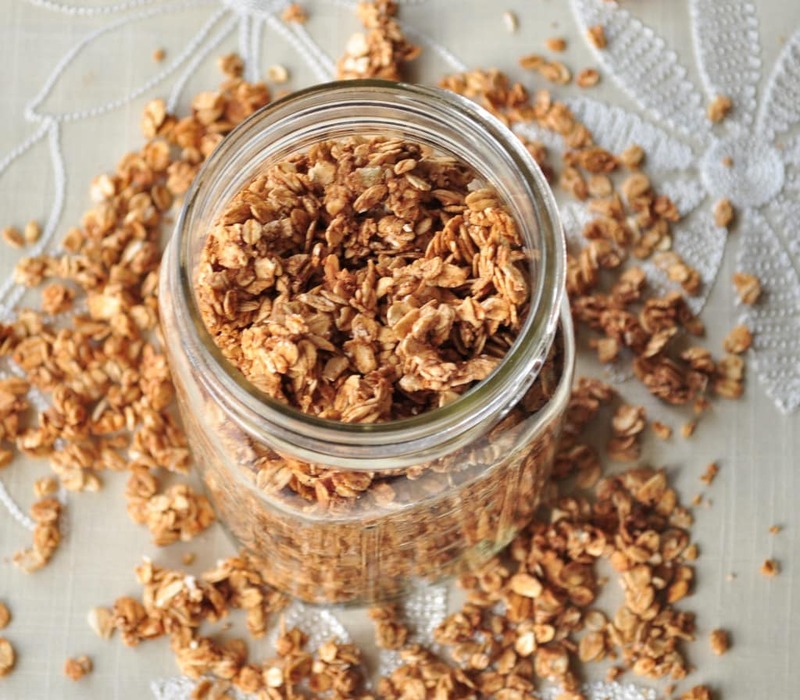 This homemade granola is a great way to start the day and it’s also gluten free. A yummy breakfast. Here is a short video of my daughter and me showing you how easy it is to make this recipe. For more videos, you can subscribe to my You Tube Channel. I am going to make this today, it sounds so good!! Also I wanted to share that my other favorite way to eat granola is on home made pancakes! I just sprinkle it on before I flip them. I can't wait to make this and try it!! One more quick question, I have everything on hand, but instead of rolled oats I have Quaker oatmeal...think that's ok to substitute? The little packets or the old fashioned oats? That's interesting. I will have to try it! We have become addicted to your granola, granola bars, and other recipes! Going to make this one today! Had a total "win" yesterday when my kids BEGGED me for one of your peanut butter granola bars for dessert instead of whining once again that Mommy doesn't buy the processed stuff anymore....yay!!! So THANK YOU!! I made this yesterday. I couldn't believe how easy it was -- I have never made granola before. Mine came out slightly more chewy than the granola I buy at the store. I cooked it as long as the recipe calls for, but do you think I just need to cook it a bit longer? It was starting to brown on the edges so I thought it was done... Thanks so much for all the great recipes. Glad you liked it! Yes, you can cook it a bit longer, but turn the temp down to 250. Not sure. Just keep checking every 10 minutes or so? Thanks Gloria! I'm sorry, I don't. But I believe you can figure all of it out using www.caloriecount.com. OMG - I just made this for the first time but it will definitely not be the last. I have tried so many of your recipes and don't know why I haven't done the granola before now. It took a little longer to crisp up but I continued baking it in 2 minutes increments. It is crisp and yummy now. I added some raisins when it was done and some fresh berries as you suggested. I am just eating it dry and loving every bite. Can't wait to try some of the other flavors. Thank you! Awesome! Glad you liked it! If you ever want to make the granola recipes crispier, just turn the oven down to about 200 and cook longer. This will prevent the granola from burning. I finally made this and am sorry I waited so long...it's delicious!!! Thank you for the great recipe. I can't wait to try more. I made your crockpot applesauce yesterday! Love it! I'm wondering, if I use this applesauce in this granola should I leave out the spices in this recipe? Glad you liked it! Yes. I would leave out the spices for sure. The applesauce should help spice it up enough. You can also always taste the batter before you bake it to see if you need anything else. Thanks! Off to the kitchen! I have olds fashioned large flake oats and quick cooking oats, the quick ones are smaller and thinner. Does it matter which I use? I think the old fashioned would work better for this recipe. This sounds yummy and easy! Going to try it. I'd like to add raisins (my daughter LOVES raisins). Would you recommend doing so before or after cooking? Thanks! Thanks! I would add them before cooking, but either way would work. No flavour at all... Probably best to add some brown sugar in with the maple syrup. Sorry you didn't care for it. So excited to try this recipe today! Have you ever tried making this in a dehydrator?!? Thanks!! I haven't, but I am guessing you could. Late to the party but I make a recipe very similar to this using a dehydrator. I toast the nuts a tiny bit first. No more burned granola! And it turns out quite chunky, which I like. looks yummy, I am making it now!!! How long will it stay fresh, & do you recommend refrigerating or keep in the pantry? Thank you! It should keep in the pantry for at least a week. If you are storing longer, keep it in the fridge.